Cambodia Daily’s interview with Dr Rethy Chhem about his work in radiology and archaeological investigations in Jayavarman VII’s hospitals. By the time Jayavarman VII came to the throne, the kingdom already had a long medical tradition, according to Dr. Chhem. In the 7th century, there had been a small dynasty of doctors at the Khmer court: one family of doctors spanning four generations, he said. Also during that century, Chinese chronicles mention that a Chinese Buddhist monk was sent to Cambodia for two years to study herbal medicine. In addition to traditional medicine, which is still practiced in the country, there was a tradition during Angkor of Brahmin priests being doctors and caring for the king using Ayurvedic medicine of Hindu origin. When Mr. Pottier and Dr. Chhem excavated the hospital site at Angkor, Dr. Chhem had hoped to find medical instruments of the time and a statue of Bhaisajyaguru—a sitting Buddha holding a jar of medicine or a plant. They did not find a statue, but unearthed numerous jars probably used for medicine that will eventually be studied by paleobot­anists, Dr. Chhem said, adding that he hopes to resume excavation in the near future. Last year, I featured the Living Angkor Road Project, a collaboration between Thai and Cambodian archaeologists to chart the ancient road between Angkor and Phimai. The project is now in its second phase, with an updated website. 25 November 2007 (The Nation) – Anyone who’s visited Angkor will know that the architecture of the famous jungle buildings are remains of ancient Hindu and Buddhist temples. Angkor Wat, for example, was a temple to the god Vishnu, who presides over the sun and the western quadrant of the compass, while the Bayon of Angkor Thom is adorned with the face of Avalokeshwara, the compassionate aspect of Buddha. The latter temple was built by Jayavarman VII, whose reign is considered one of the greatest of Angkor. But was there something more to the transition of the state religion from Hinduism to Buddhism? Angkor scholar Vittorio Roveda thinks so. Beng Melea, creative commons photo by Hartford Schmidt. 09 September 2007 (The Nation) – A feature on the Living Angkor Road Project, a joint study between Thailand and Cambodia to investigate a royal road connecting Angkor to Phimai. The road was refurbished by Jayavarman VII (c.1125-1215), a devout Mahayana Buddhist. Jayavarman VII is better known for constructing the city centre of Angkor Thom and is considered the greatest king of Angkor in Buddhist Cambodia. The Living Angkor Road Project wiki was previously mentioned in this site. Braving the sizzling late-summer heat of the border jungle between Surin province in lower Northeast Thailand and Uddor Mean Chey province in northern Cambodia, I joined researchers tracing a route trodden by the ancient Khmer from Angkor to Phimai. “Stay on the track,” we are warned from time to time. The trail has not been completely cleared of landmines. This route has been in use since ancient times and parts of the road can still be seen – laterite blocks covered with moss and lichen. Angkor Thom is many times larger than Angkor Wat, which by itself is the size of six football fields. And the even huger rectangular plot that we call the Western Baray was a man-made reservoir. Although no longer in use and now only half filled, one can immediately appreciate the immensity of Angkor’s water management system that has made the news this week. 02 August 2007 (Bangkok Post) – This editorial reflects on how Thailand and Cambodia can overcome their bilateral tensions through archaeology; but the underlying archaeological story is interesting too, about a travel route on a royal road between Phimai and Angkor. How should archaeological ruins, the remnants of past glorious kingdoms, serve our present and help us cope with an uncertain future? This question came to mind over the Asalaha Bucha and Buddhist Lent holiday last weekend when I joined a press trip to explore the ancient Phimai-Angkor road. For five days, we hiked the forest strewn with land mines, walked the paddy fields and braved the dirt roads under a scorching sun to see numerous ancient rest stops, hospitals, reservoirs and laterite bridges along the route linking Phimai and Angkor when the Khmer civilisation was at its zenith. The exact location of this 254km-long ancient route has been identified for the first time by the Living Angkor Road Project supported by Thailand Research Fund. A collaboration between Thai and Cambodian researchers, the Thai team is led by remote-sensing expert Col Surat Lertlum while the Cambodian team is led by anthropologist Im Sokrithy. The research started with the clues in the 12th-century Stone Inscription saying that King Jayavarman VII had ordered 17 rest houses built along the Angkor-Phimai royal road. A study by French scholars a century ago identified most of the rest houses but did not identify the exact route. By integrating advanced technology in remote sensing, geographical information system and geophysics with conventional studies in anthropology, archaeology and history, the Living Angkor Road Project has found the missing links. Read more about the Phimai-Angkor Royal Road. An informal presentation by the authors of the new book, Ta Prohm: A Glorious Era in Angkor Civilisation will be held at Ecole FranÃ§aise d’ExtrÃªme-Orient (EFEO) Siem Reap on Monday, 25th June. and Prof. Sachchidanand Sahai, Fellow, Indian Institute of Advanced Study, Simla. Â« Ta Prohm: A Glorious Era in Angkor Civilisation Â» ” (White Lotus, Bangkok) offers a new look at the biography of Jayavarman VII, focusing on the ideology of abnegation followed by this Angkorian monarch. With his well-developed policy of welfare, the king surpassed the contemporary European kings. The monograph shows how Ta Prohm was intricately connected with the royal welfare programs, since its foundation stele describes in details the assistance given to the hospitals from the royal treasury. The monograph presents the temple of Ta Prohm in the context of Cambodian history, as the first dated temple of the reign of Jayavarman VII (1186), symbolizing the perfect wisdom in Khmer civilization with the mother of the king represented as Prajnaparamita, the mother of the Buddha. The monastic and spiritual life at the temple has been graphically reconstructed through a closer study of the inscriptions of Ta Prohm. Impressive annual and daily grants offered by the royal treasury to sustain the spiritual life of the kingdom have been meticulously detailed. A systematic study of restoration policy has been made in the context of over a hundred years of practical experience at the sites of Angkor. It has been argued that Ta Prohm can be a useful test case for the refinement of ideology and techniques of restoration based on the criteria of authenticity. This first monograph-length study of the most enigmatic temple of Angkor complex offers an indispensable reading, both for the visitors, and specialists, interested in unlocking the puzzles of Angkor art. Shri Pradeep Kumar Kapur, a career diplomat of the Indian Foreign Service, is well-known for his deep interest in the theory and practice of political, economic and cultural diplomacy. He has worked in diverse areas in the Ministry of External Affairs and in the Ministry of Commerce, Government of India. He has also made significant contributions in expanding the scope and content of India’s external relations during his postings in the Indian Embassies/High Commissions in Spain, Tanzania, France, Nepal and Cambodia. 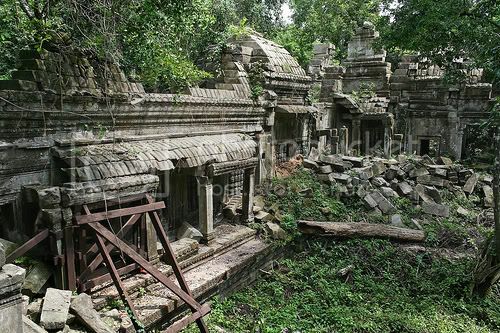 During his tenure as Ambassador of India to Cambodia, Kapur took up the famous, but extremely difficult site for restoration of the Ta Prohm temple monument in Angkor, as a test case of cultural diplomacy between India and Cambodia. Sachchidanand Sahai is an alumnus of Banaras Hindu University where he studied Indian and Southeast Asian Art and Archaeology. Specializing in the Khmer studies at the University of Paris, Sorbonne (1965-69) under the supervision of eminent French savant George Coedes, Sahai produced a pioneering doctorial thesis, published by the EFEO in 1971. Since, he authored many publications. The founder editor of the Southeast Asian Review, he has edited and published thirty volumes of this journal since 1976. In 1981, he founded the International Conference on Thai Studies. Sahai held a chair of Southeast Asian Studies at the Magadh University, Bodh Gaya (India) and worked as the pro-Vice Chancellor of the university in 2001. As Research Professor at Indira Gandhi National Centre for the Arts, New Delhi (1988-90) he set up the Southeast Asia division of the centre. Recipient of French government scholarship, Fulbright post-doctoral Fellowship, Visiting Fellowship at Australian National University and Maison de Science de l’ Homme (Paris), Sahai is currently Fellow, Indian Institute of Advanced Study, Simla. Monday 25th of June 2007, at 6:30 pm at the EFEO.